Avast ye! Arr ye worthy to take on the scourge of the deep? Aye, ‘tis the Kraken that be plaguing us. Chased us for miles, he did, until finally here we rest, our once proud ship smashed upon yer cursed beach, gutted like a fish, and our booty sent to Davy Jones’ Locker. ‘Twas mighty pleased we was to spot land. A fine new home it will make! Aye. For surely, ye can’t be expectin’ us to leave? Not with our ship in pieces and the skurvy kraken waiting for us! What say ye? Ye’ll help us rebuild and recover our gold? Shiver me timbers, lad! That’s mighty kind ye arrr. Then we’ve no need to plunder this ‘ere island. Let’s get to work! 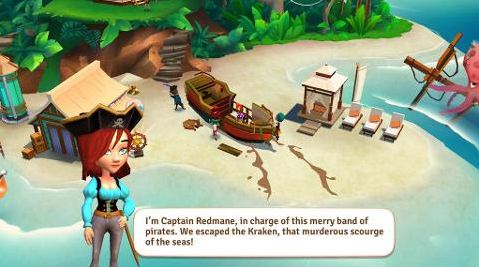 If you’re at least level 9, you will receive a pop-up to the Pirates in Peril event. You will need to force-close the game to see the update, or even reboot your device. 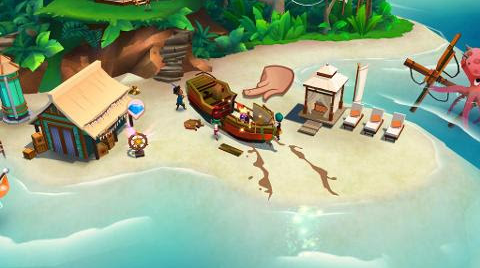 Start off the event by tapping on the Pirate Shipwreck area. 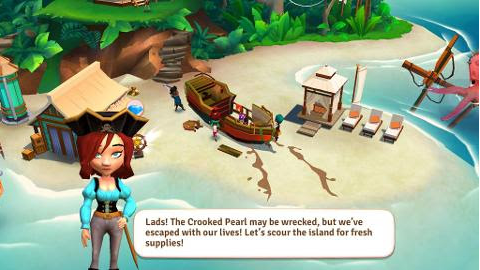 It is a wrecked galleon near the beach which gets fixed and improved while you finish each stage. Craft items from materials found around the Kraken's Bounty. A large octopus is lurking around this spot, so make sure to look out for yourself! The more items you find, the more rewards you earn. 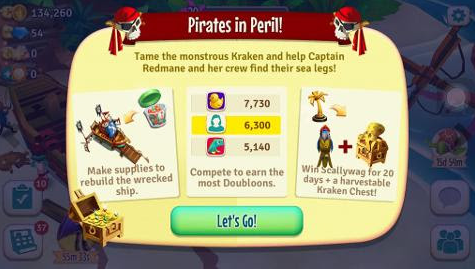 Reach your personal Doubloons goal to unlock rewards! Earn Gold Rank at the end of Round 1 on September 22, 2018 to win Scallywag, Redmane's parrot and first mate, as a guide for the next 20 days! If you manage to stay in Gold Rank during the second Round, which ends September 28, you will also win a harvestable Kraken Chest! Watch out for Barrels of Rum floating along the beach! Click on them to earn extra Doubloons! 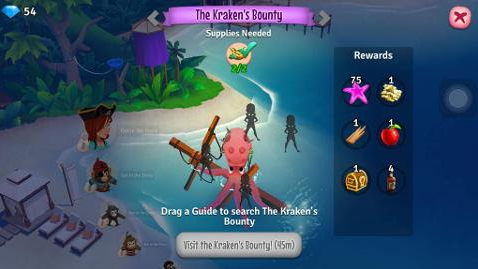 Guides can search for items around the Kraken's Bounty to find ingredients and crafts to be used in rebuilding the wreck. This is a temporary area where you can search for event items needed during the Pirates in Peril competition. 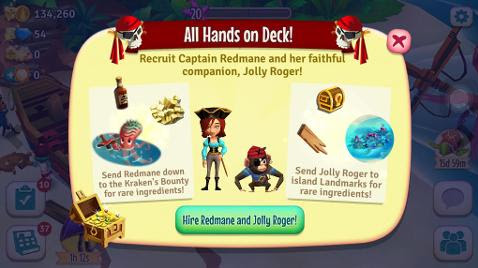 You can purchase Captain Redmane and/or Jolly Roger, the monkey, as Temporary Guides to help you out during the Pirates in Peril event. They will give you a higher chance of finding rare ingredients and more!